The Xarelto blood thinner has been available in the U.S. since 2011, where it has been promoted as an alternative to the decades-old anticoagulant, warfarin. Used to prevent the risk for dangerous blood clots in individuals with atrial fibrillation and other conditions, the oral medication has also been associated with cerebral and gastrointestinal hemorrhaging, as well as other internal bleeding side effects that may be life-threatening. 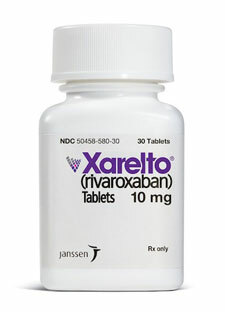 Xarelto, which is known also by its generic name as rivaroxaban, is one of the newest anticoagulants on the market today. Developed by Bayer and marketed in the U.S. by Johnson & Johnson’s Janssen Pharmaceuticals subsidiary, one discerning quality of this blood thinner is that it is prescribed in a uniform dose, rather than in specific doses to each individual. The Xarelto blood thinner was originally cleared by the FDA in July 2011 for individuals who underwent a knee or hip replacement surgery and may be at risk for serious blood clots, deep vein thrombosis (DVT) and pulmonary embolism (PE). A few months later, the agency expanded Xarelto’s list of approved uses to include the treatment of individuals with atrial fibrillation who had an elevated risk of stroke. That change, made in November 2011, preceded the FDA’s decision to approve the drug for pulmonary embolism (PE) and deep vein thrombosis (DVT) in 2012. If the influx of Xarelto bleeding reports filed with the U.S. Food and Drug Administration (FDA) are any indication, this side effect is far from infrequent. The Institute for Safe Medicine Practices (ISMP) found that in 2012 alone, over 2,000 adverse events involving the blood thinner were reported to the FDA, including 151 fatalities. The majority of reports involved instances of serious internal bleeding. Among other things, the ISMP found that elderly patients taking Xarelto were 7.2% more apt to die of internal bleeding than those being treated with warfarin. Warfarin users ran a 6.5% chance of reaching a fatal outcome. Considering a Xarelto Bleeding Lawsuit? Call Us Today. If your loved experienced a fatal or near-fatal episode of Xarelto internal bleeding, the time is now to take action in filing a claim. The attorneys at Bernstein Liebhard LLP are offering free and confidential case reviews to anyone who may have been injured by the blood thinner.